All rocks contain minerals made of elements. 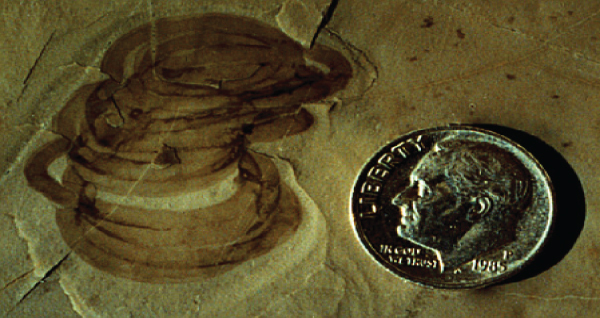 Some elements exist as radioactive isotopes that can act as radioactive clocks. As the rock ages, the radioactive "parent" isotopes (e.g. Uranium) decay at a steady rate into non-radioactive "daughter" elements (e.g. Lead). Thus, the older a rock is, the larger the number of daughter elements and the smaller the number of parent elements are found in the rock. 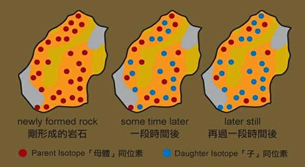 By measuring the ratio of radioactive parent isotope to non-radioactive daughter element we can calculate an 'absolute age', which is the time when a particular mineral formed. This way we are able to attach numerical years to the fossil-based relative time scale and figure out, for example, when exactly the first dinosaurs appeared on Earth - 225Ma ago. 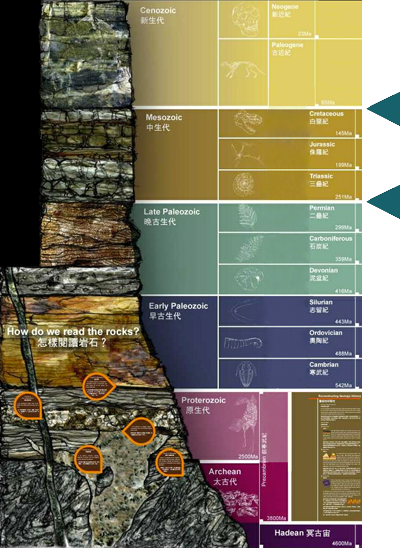 The Museum's Earth Evolution display is structured according to the following divisions of geological time in Eons, Eras and Periods based on the dates and nomenclature proposed by the International Commission on Stratigraphy (IUGS).